I have been very lucky. I have always found these halos visually exhilarating so I produced a poster about them for the 2019 Royal Society of Chemistry Twitter Poster competition in teh Chemcial Education Category .Then this came through the emails. We are delighted to let you know that you have been awarded Further Education prize in #RSCEdu for your poster entitled; "Chemical halos - the beauty of chemistry"
The subject chairs thought your poster really stood out and contained some fantastic science – congratulations! Catching the students’ imagination through practical work is one reason teachers do it. Going that extra mile/metre and using the evidence before your eyes to delve into the inner workings of chemical processes in another matter. It requires both teacher and students to work with very tiny particles which you cannot see. However, you can see the effects they are having during chemical reactions. Letting the particles work for you though microchemistry techniques can be far more rewarding than just a "magical "event. I can still remember being excited (and I was in my 60s at the time ―sad, I know) in seeing the first alkali/acid halo. Here is parade of halos for you. The effect works because gases evaporate from solution (ammonia) or are evolved via a chemical reaction (sulfur, nitrogen or carbon dioxide). The gas particles (molecules) move through all the oxygen and nitrogen molecules in air within the Petri dish and finally enter the puddle. We need have to get this into perspective. The molecules at 1atm and 300K are moving on average at speeds of 500metres per second (over 1100 miles per hour). There will be 1,000,000,000 to 10,000,000,000 collisions per second. Stop a moment and let those figures sink in. That velocity is as fast as a bullet from a rifle, double the speed of an airliner). It would take you between 30 and 300 years to count that number of collisions at the rate of one a second. The first diagram below represents ammonia diffusing; the first is a simplistic view of brown ammonia molecules diffusing from the container of ammonia solution to the puddle; this is typical of what you might find in a text book. The second diagram puts in 80 nitrogen molecules and 20 oxygen molecules. However this not a true reflection of the situation. I would have to draw 100 versions of the third diagram to ensure that an ammonia molecule is present as shown in the last diagram. Stop a moment and let those figures sink in. As well as the invisibility of the particles to our eyes, the students and teachers are dealing with enormous numbers of molecules of oxygen and nitrogen that the ammonia has to diffuse through. The ammonia molecules have been buffeted by air molecules and moved to the out parts of the puddle where they encounter water molecules. The NH₃ molecules become incorporated because there is intermolecular attraction between a water and ammonia molecules (see diagram on the right). This is electrostatic attraction. It arises because the molecular array has reduced its potential energy via this attraction. We give all sorts of names to these electrostatic attractions but they exist between particles from the structure to the atom to the extremely week induced dipole effects between inert gas molecules. So how do the numbers add up here? You can detect the odour of ammonia at 1 ppm, that is, one part in a million. The picture on the left below shows one green ammonia molecule with 1000 molecules of water. I would have had to draw 1000 versions of the diagram below right to find that diagram on the left with the "green" ammonia molecule. Ammonia in water is quite lonely. Many of our diagrams in textbooks give the wrong impression. Ammonia in water is weakly alkaline because not all molecules react with water to form ammonium and hydroxide ions. However, I am interested in the hydroxide ions because they are the ions that will ultimately react with the indicator molecule and change the colour on the outer reached on the puddle. On average, there is one hydroxide ion for every 240 ammonia molecules entering the water. The presence of ammonium and hydroxide ions are even more remote. I admit I have not addressed the dynamic nature of this relationship between water and ammonia. The puddle consist of 1 drop of water, one drop of Universal Indicator and 1 drop of 0.1M hydrochloric acid. The acid is effectively 0.03M. The diagrams below each contain 1000 molecules of water and that is about the right number (1800) to surround one yellow chloride ion and black hydrogen (or hydronium ion) which are both found on the left hand side. But for the hydroxide and hydrogen ions the rate is 20.6 and 36.2 μ/10⁻⁸m²s⁻¹V⁻¹ respectively. This is much quicker than expected. These tow ions do not diffuse but move via transport precesses. As the OH- shunts to a water molecule that water molecule ejects another hydroxide ion and so on. The negative charge is moving though the solvent water molecules, not the hydroxide ion itself. You can see this on https://gph.is/g/ZrPj8jE. Again this is far more involved than what you see here.I am limited by time and just the sheer complxity of making computer models. The hydrogen ion is a proton and there is evidence of clusters of water molecules with them. The simplest cluster (H₃O⁺) is shown between the square brackets. If a water molecule has enough energy to hit a cluster in the right position, it forms a cluster itself and the positive charge moves though the solvent water molecules. Effectively it is "hole" that is moving through the water. The billions of particles in puddle are in constant movement and colliding. At some point, the hydroxide negative ion with its extra electron will encounter "a hole" and the charge neutralised. There is a sudden drop in potential energy manifested in the heat of reaction which increases the temperature of the puddle and some of it is distributed amongst all the micro-energy states of water (movement, rotation and vibration). This is an increase in entropy. The approximate relative number of particles in the puddle can be seen on the left. You see just how "lonely" many of our chemicals are in our watery solutions. Much of the research education is dealing with how we understand the nature and interactions of particles in chemical reactions. This is because equations in examinations rely on this understanding. And if you get the equations right, more marks are obtained in examinations. So not only does the school student (and teacher) have to imagine in the view of chemistry, particles so small they cannot be individually weighed or seen directly, the student (and teacher) also have to cope with phenomenally large numbers. It is said there are 1,000,000,000,000,000,000,000 stars in the observable universe (1 x 10²¹) but in 18 ml of water there are 6 x 10²³ molecules. This uber-macroscopic number of interacting particles is as much an issue with the understanding of chemistry as the sub-microscopic nature of the particles. This needs a HUGE imagination! Visualising particles in aqueuos solutions via computer is also is very difficult. The nearest I have come to is Roy Tasker's work on http://www.visichem.thelearningfederation.edu.au/topic09.html. Mounting the barrier of understanding between the macro event in a chemistry event and the interpretation at the nano level is one the most difficult achievements for both the student and the teacher..
Where does the chemistry teacher start with chemistry? 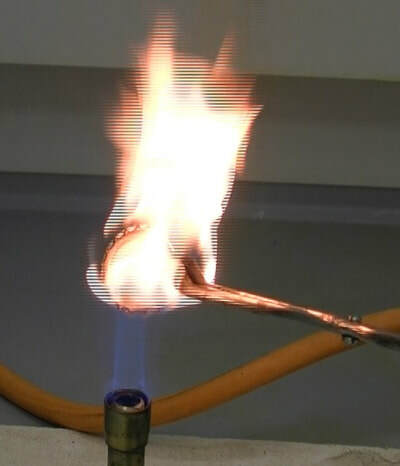 The typical traditional start in UK schools was with the destructive nature of the Bunsen burner with safety to introduce practical work and then onto elements, mixtures and compounds (which is quite a difficult concept) with separation techniques. Chemistry is holistic with each concept affecting another. Quite honestly, you can start anywhere but there is that understanding barrier in the way. Perhaps, like Alex Johnstone in 1966, and Peter Atkins with his 9 “big ideas” you should start as early as possible with the idea that matter is made up of very small particles and what you see at the macro level is a consequence of what is happening at the nano-level. These particles are too small to see directly so you have to use your thoughts, dreams, diagrams etc to concoct visions of what is happening. I see many books/courses which start with "small particles" but the idea is not maintained through the ensuing pages. Both of Johnstone's text books (Chemistry Takes Shape Vol 1-5 in in1966 and Chemistry Takes Shape in 1980) maintained this commitment to the first big idea of Peter Atkins all the way through. Once a teacher starts with this difficult concept, reinforcement of the idea must be maintained. if you wish to read more about big idas see the article by Vincent Talanquer.· . On my visit to the ICCE2018 meeting I came across the superb VISCHEM computer models (http://vischem.com.au/) produced by the Roy Tasker group. Two videos caught my eye immediately because they are a part of my microscale workshops. The precipitation video (http://www.scootle.edu.au/ec/pin/HVFJXB?userid=71715 and scroll to "precipitation of an ionic salt") showed the silver chloride precipitate forming a line (picture below) and I thought that is just like one of my diffusing precipitate videos. The Vis-Chem video of the macro event at the beginning of the video shows the traditional test tube reaction. The colourless solutions have been already prepared and then mixed with a white precipitate forming. Now watch the microscale version. Here is the line of silver and chloride ions coming together to form a precipitate. This microscale version though shows the addition of the solids to the puddle and in the space of just over a minute, the whole macro process that the Vis-Chem video describes (and more because this procedure shows the dissolving process) takes place in front of the student in under 2 minutes. 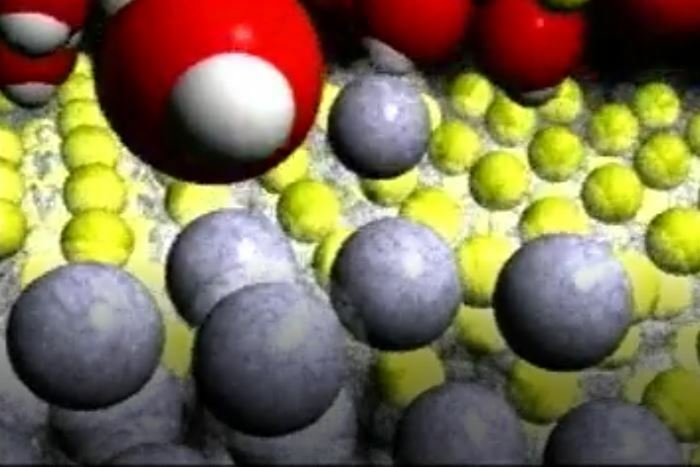 The microscale puddle video shows what happens when silver nitrate and sodium chloride particles are dissolved in water how the ions are solvated by water (see below), breaking up the solid crystal lattice, how the ions move by diffusion using kinetic energy, and ultimately, how the silver chloride forms as a solid. 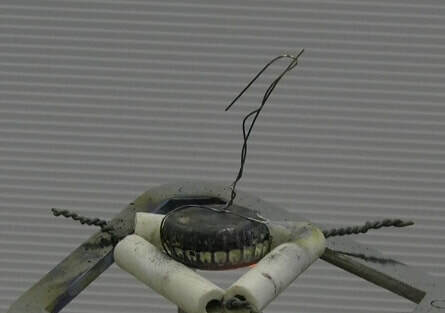 The second video concerned the displacement reaction between silver nitrate and copper metal (http://www.scootle.edu.au/ec/pin/HVFJXB?userid=71715 and scroll to Redox reactions). The macro experiment in the film shows the action of a colourless solution to copper foil. Silver is formed on the copper and drops off. Now look at the microscale version under a USB microscope. The silver crystals (like fir trees) can be seen growing outwards. All displacement reactions, where a more reactive metal displaces a less active metal ion from the solution. Some displacement reactions such as magnesium on metal salt solutions, eg iron(II) sulfate, result in the formation of the less active metal but at the same time, bubbles (of hydrogen gas) are seen along with the formation of iron(II) hydroxide precipitate. So there are competing reactions as shown below with electrons reacting with water and with iron(II) ions. There is the "puzzling" reaction when zinc and copper metal ae attached together and placed in a dilute acid. The bubbles of hydrogen appear on the copper metal as the electrons move from the zinc to the copper and react with the acid on the surface but it is the zinc metal that dissolves. There must be a lower kinetic barrier for this mechanism as rather than zinc reacting directly with acid. The copper is effectively acting as a catalyst. Aishling Flaherty of Limerick University presented a plenary address on 1st year University students find "curly arrow" explanation of organic chemistry reactions difficult. ‘Twas ever thus. I did it in 1964 and it was tricky to many then. But chemistry then was taught as physical, organic and inorganic with distinct rivalries. Is it still? Unless the Big Idea of electron movement (with electrons falling into a hole or even a depression “a partial hole”) is used in both inorganic and organic chemistry, we shall still be struggling with the understanding of these concepts. VisChem also looks at some simple organic reactions. When the questions are asked how and why does this happen, then the Big Ideas of entropy increase and conservation of energy come into being, with the proviso that there may be a kinetic barrier. The molecular shape and intermolecular forces between molecules, especially in water at school level, are crucial in the mechanisms in which electron pairs are attracted to electron deficient (holes) species. There is periodicity because I can carry out these reactions with compounds of elements in the same groups. And it all happens because matter is made up of very tiny particles. It is all very holistic. Looking for connections in inorganic chemistry reactions and indeed, between different branches of chemistry, is a form of “chunking”, a process (see diagram below) in which “individual pieces of information are bound together into a meaningful whole” (Wikipedia). Instead of learning loads of separate facts, you apply basic ideas from which you can ascertain an answer to an exam question. Would it were so simple! Exams are so important that students are scared of being wrong and teachers are worried for their jobs because they may be blamed for exam failures. It is safer to students to have many “fact cards” to learn by heart. Application of present knowledge to new situations really throws students, A recent UK examination question about boiled carrots caused consternation because “we had not studied carrots” but they had studied osmosis in potatoes! And osmosis all about matter consisting of very tiny particles, invisible to the naked eye, the first of P W Atkins big ideas. One on the objections to devising new equipment or novel procedures is the cry from some teachers that students will be at a disadvantage because the examiners will not ask questions about that procedure in the exam. There has to be an overwhelming reason to me for changing a procedure including safety, reducing expenditure, improved classroom management, increasing the efficient use of time, more informative chemistry, gaining more insight to chemical processes and responding to the findings in chemical education research. On our CLEAPSS Helpline we get many enquiries about experiments not going as well as "the book" describes. I also mean by “the book” the suggested Examination Board procedures. In the UK, we have moved to a skill assessment of student's practical ability but the Boards still print out "suggested procedures" which we know at CLEAPSS to have flaws. Flaws that have been there for years and no one addresses. When making copper sulfate crystals from copper oxide, students still use the Bunsen burner to boil water to react the oxide with the acid. All that is required is to immerse a boiling tube of the mixture in a beaker of hot water from the electric kettle (A new invention compared to date that this experiment was first published over 120 years ago). Teachers and technicians complain that the spots in paper chromatography are so large, Rf values are diffiult to measure and nothing like the lovely little spots in the text book. The indestructible crucible is another case in point. I started looking for an alternative to crucibles as soon as I joined CLEAPSS (www.cleapss.org.uk) as I received repeated reports of poor results for the magnesium/oxygen reaction carried out in crucibles. Students could not lift and replace the lids quick enough or they dropped the lids and they broke; that was caused by tongs not closing correctly because they had been “vandalised” in previous classes. 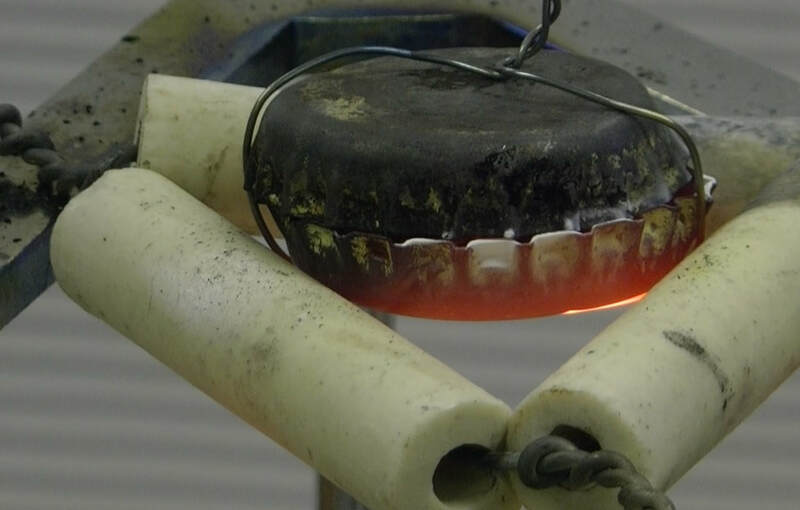 Crucibles would crack apart on sudden or cooling. Using stainless steel and nickel crucibles on a class basis were the only alternatives available but they are expensive. I then got the ideas of using steel bottle tops. First the plastic insert of the steel bottle top needs to be burned away in the fume cupboard. The mass of the 2 tops and nichrome wire are measured on a 2-decimal place balance and again with between 0.12 and 0.20g of magnesium. The arrangement amazingly fits onto a small pipe-clay triangle, heated strongly for 10 minutes, and then allowed to cool. No interference is necessary at all. 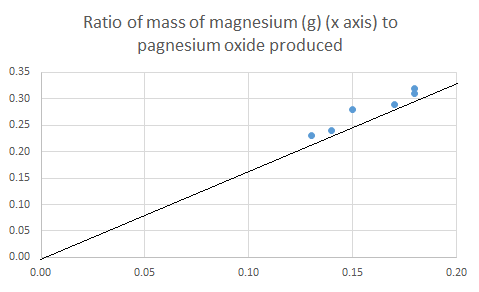 It an early stage in the students’ career, the results can be plotted on a graph which contains the line that represent s the mass ratio of magnesium to magnesium oxide. Invoking the spiral curriculum, the procedure can be repeated later and the mole ratio can be found as shown in the table. So here is the teachers dilemma. Does the teacher ditch the exam board procedure using a crucible and lid when it provides poor results. Poor results have an effect on the student’s appreciation of the subject, practical work and confidence in their skills and ability? Or does the teacher give the students a procedure which consistently gives the text book stated rise in mass on burning and a close mole 1;1 ratio of magnesium to oxygen although it is not like the method provided by the Board. A question on the Examination paper will almost certainly relate to the poorer porcelain crucible method? ,of course Student’s could carry out both methods. The teacher could demonstrate one method. These procedures are not exams, as they used to be, but are assessment of students’ skills. Carrying out a gravimetric titration with a pipette and balance is another alternative method and since developing this, I wonder if Friedrich Mohr would have used a balance to 2 or more decimal places, if they had been available in the 1850s, rather than a burette. This gravimetric method is not only easier and quicker to carry out but can be used as an introduction to titration without all the glassware and provide a comparison of methods. There are some advocates of gravimetric titration who say that the volumetric method is outdated. Another area is in distillation where suggested cumbersome glass delivery tubes have broken and caused injury. But there was an ingenious solution this dilemma provided by a school technician the other week. He was introduced to the microscale electrolysis of copper(II) chloride solution carried out in a Petri dish and took it back to the school. “It is not like the equipment the students will be asked questions on though” said the teacher. "It will confuse them". The technician provided the answer in the form of a diagram inserted beneath the Petri dish and the teacher was really pleased. I am the (retired) chemistry advisor for CLEAPSS (www.cleapss.org.uk) in the United Kingdom. I acquired degrees in chemistry at the University of Sheffield. I then taught students for 20 years, 16 years as Head of Department at Norwich School in the UK, and finally 21 years at CLEAPSS. However, I cannot simply leave chemistry and education so I now work part time for CLEAPSS solving all manner of technical and teaching problems.